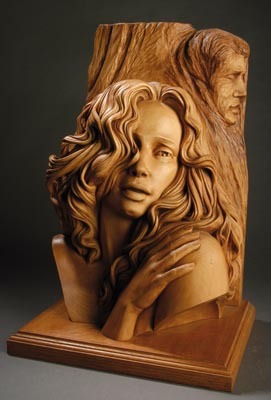 Fred Zavadil is a self-taught professional carver who has gained a reputation for the sculptural quality of his carvings. 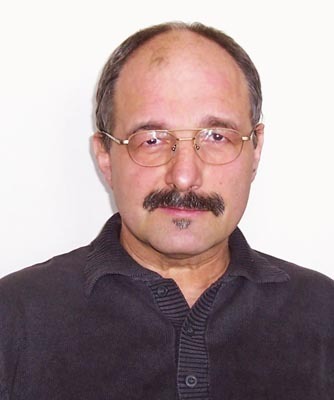 He was born in the Czech Republic and emigrated to Canada in 1989 for political reasons. A bricklayer by trade, he earned a living in construction during his first years. Fred had long held an ambition to be a woodcarver and in 1992, after seeing a friend's carvings in Toronto, he decided that he had to try the art himself. He signed up for a beginner's carving class through local adult education classes. He later attended a summer course in sculpting at the Ontario College of Arts in Toronto, other than that, Fred has had to rely on his natural talent and watching others carve to develop his own skills. Talking of the early days he says, "I started carving on our dining table. When we wanted to eat, we had to first clean the wood chips from a part of the table." Fred was so determined to work as a carver that he had answered an advertisement calling for an experienced woodcarver to complete work in a church. He was offered the job and accepted it knowing that he had no experience or knowledge of producing architectural carving. He learnt to carve by watching fellow workers and said with a laugh, "I was flying by the seat of my pants". Fortunately, despite the challenges of his limited English and job knowledge, his co-workers were willing to show him what was required. He learnt quickly. In 1994, he and a co-owner were hired to work in private homes on projects such as an elaborate staircase and intricate inlaid flooring. This work required the ability to design and carve intricate architectural carving, as well as work with customers who appreciated and demanded high quality work. In 2000, Fred started work as a sculptor for a fine arts company creating artwork for churches. 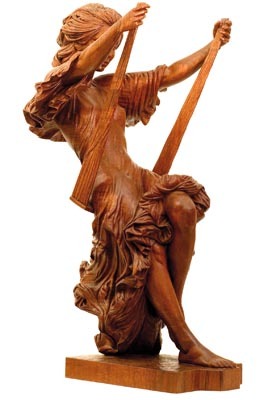 They needed a sculptor who could create religious figures in various media including bronze, resin and wood, and hired him after seeing photographs of the Madonna and Child and the Crucifix. 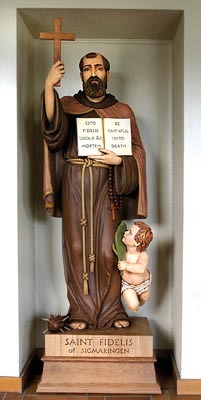 It was the first time Fred had the opportunity to create life-size figures though as a result, much of Fred's best work is unsigned and installed in churches throughout the United States. However sad this may be for the general population of woodcarvers, for Fred it was an opportunity for him to evolve as an artist and woodcarver, and he considers this period of time to be equivalent to completing an apprenticeship or university degree. In 2002, Fred set up his own business working on religious commissions as well as architectural carvings for private homes and businesses, though he finds the time for one or two carvings of his own each year. The first carvings were carved from mahogany and include a horse, and a male and female figure, which are striking in their simplicity. They all demonstrate that from the start of his sculpting career, he had focused on the form and structure rather than going straight into developing the peripheral detail. Details are essential to the final outcome, but should only be worked on later in the process. 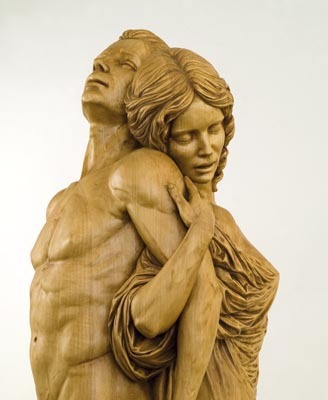 He emphasises the need to first create the correct proportions, bone, and muscle structure beneath the skin, adding, "If you add detail to poor form, no matter how great the detail is, the carving will not look right". Having drawn a few rough sketches, Fred works out the limb movement in relationship to the trunk and pelvis. He enjoys the challenge of incorporating asymmetry into his figures to create a form of dynamic tension within the pose. It is as if his figures have just landed in a position or are about to move from a pivotal point of contact with the ground due to the movement of their limbs. Once he has a few sketches of the figure, he decides on the total figure height, as this will determine the body proportions. He says, "I almost always make a clay model for my carving. The clay allows me to experiment with posture and facial expression; it also gives me the opportunity to see how to efficiently laminate wood for the carving. The model usually has about 80% of the details I want to carve." He creates a metal bracket and copper wire armature, and places the limbs in the desired action positions according to his sketches, paying attention to where the joints are, ensuring that the armature remains true to the figure's scale. First he builds up the clay model using an oil-based, non-drying product called Klean Klay Modelling Clay. He will spend as much time as needed in fine tuning the clay model until he is completely satisfied with the figure's underlying bony structure and musculature. The second stage in the clay model is adding clay slowly, as if he was "layering on the clothing" to create the natural fabric folds and creases. For the hair, Fred adds small rolls of clay to build up the body of the hair. He then manipulates the clay on the face to create the desired expression. Keeping to the two stages takes discipline, but the end result is a clay model that looks alive and realistic. He considers both stages equally important. Once the clay model is completed, Fred makes up the wooden blank as he prefers laminating wood to using logs. I noticed he only has a tablesaw in his studio, which after much "sceptical thinking" on my part, I discovered he used with the accuracy and precision of a scroll saw. Clay models have a softness that can capture a mood or portray an emotional expression, which is not easily translated over to a wooden figure, as the medium of wood is harsher. I am not referring to copying the model's features exactly, but rather the challenge of successfully reproducing in wood the sensitivity and fragility that can be achieved with a clay figure. I believe that it is here that Fred is fortunate to have natural talent that sets him apart from other carvers. He is able to create woodcarvings that seem to breathe and look as though they are in motion. The viewer can immediately appreciate the delicate fabric or imagine the figure's hair blowing in the wind. 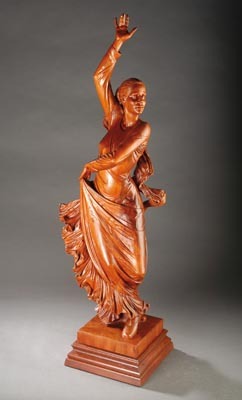 Fred's mastery of portraying realistic fabric folds that hints at the figure's movement underneath the fabric is especially noticeable in his female figure carvings. As he says, "I just have my way of playing with the fabric, there is almost always an excess of it in my carvings. I just like it." Fred completes work using different media such as clay, wood, resin, and bronze. For fun he has carved in snow and sand, but his first love remains wood. 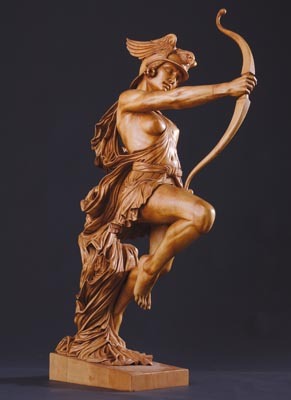 While Fred's initial carvings were in mahogany (Swietenia macrophylla), he now tends to favour basswood (Tilia Americana) as used for The Archer. His preferred method of sealing the basswood prior to staining is to apply up to three coats of 50/50 sealant, a mix of 50% varathane with 50% mineral spirits. He lets the first coat saturate the wood and then lets it dry for a day. He then lightly rubs the surface with the finest steel wool available to reduce any rough areas. It is imperative to clean the carving of any steel wool particles before applying the next coat. Further coats can be a 60/40 mix with less mineral spirits, always allowing it to dry thoroughly before the next coat. 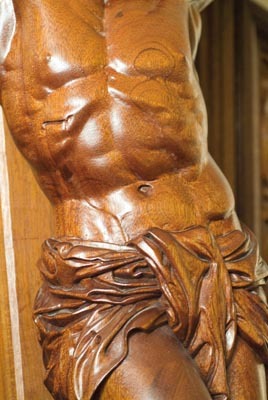 Next he applies an oil based stain, rubbing it off lightly and almost immediately with a lint-free cloth so that the entire carving has a hint of the stain. He leaves the stain in the areas requiring shadow or darker colour such as in the creases. No other finish is required. 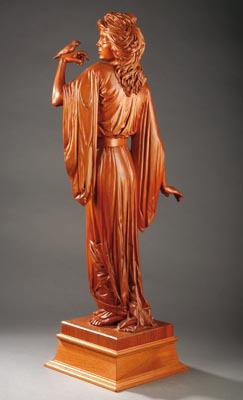 The overall effect is stunning and the carving appears to come alive, as there is a depth to the clothing and hair that is not present when only the 50/50 finish is covering the carving. Though he prefers unpainted wood, he admits that some carvings look better with some colour as his recent Maestro Cellist reveals. The quality and sheer exuberance of Fred's work continues to draw admiration and international praise. One of the best comments overheard at the International Woodcarvers Congress in Davenport last year was, "Whoever carved the Maestro had to have been in prison to have had the time to do such a perfect piece, and I certainly hope he is on death row". That comment made Fred laugh out loud when he heard it. "Fred has had to rely on his natural talent and watching others carve to develop his own skills."